Pictured above left to right: Zack Cain, Paul Torre, and Steven Yu have received Critical Language Scholarships. The prestigious CLS Program is part of a U.S. government initiative to expand the number of Americans studying and mastering critical foreign languages, which the U.S Department of State defines as those languages less commonly taught in U.S. schools but essential for America’s national security and economic prosperity. CLS scholarship winners spend eight to ten weeks abroad studying one of 15 critical languages, including Arabic, Azerbaijani, Bangla, Chinese, Hindi, Indonesian, Japanese, Korean, Persian, Portuguese, Punjabi, Russian, Swahili, Turkish or Urdu. 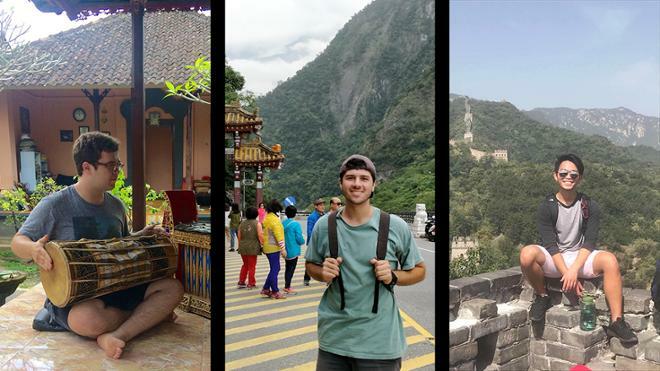 Zack Cain, a senior from Rockville, Maryland, will study the Indonesian language in Malang, East Java. Cain is majoring in music and minoring in Teacher Education: Secondary. Cain has previously spent time in Bali, Indonesia, researching the musical traditions of gamelan, a style of ensemble music indigenous to the island. He learned to play the lanang, a drum that is essential to the performance of gamelan music. “Being able to spend two months focusing on language skills feels like a once in a lifetime opportunity, and the thing I look forward to most is being able to connect with the performing arts community in Surakarta and share my own musical identity as well,” said Cain, who plans to spend an additional year researching in Indonesia. Paul Torre, a senior from Wantagh, New York, will study Mandarin in Changchun, China, for two months this summer. Torre will graduate in May with a Bachelor of Science degree in computer science and a minor in mathematics and a Bachelor of Arts degree in Chinese Studies. He has been studying Mandarin for more than eight years and also speaks some Japanese. He has previously studied abroad in Hangzhou and Beijing, China, and Taipei, Taiwan. “I am excited to round out my college experience with one more intensive study of Chinese and advance my knowledge of China's diverse regions,” said Torre, who will join Capital One as a junior software engineer in the Washington, D.C., area when he returns. Steven Yu, a senior from New York City, will travel to Taiwan this summer to participate in intensive courses in Mandarin. His language immersion will be supplemented by excursions across Taiwan. Yu is double majoring in environmental studies and Chinese studies and minoring in business administration. “My family is from Taiwan, and this program will allow me to not only see where they came from, but also improve my Chinese to better communicate with them,” Yu said. To date, 16 University of Richmond students have received this scholarship. For more information visit clsscholarship.org.